The new data submission period, for the 1st Quarter of 2016, is now open. Suppliers can go to HMEAuditKey.org to register; participation is free – you just need one of your organization's NPIs and respective 5-digit zip code to register and get started. 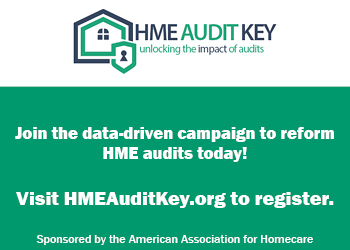 The HME Audit Key survey provides reliable and representative data that clearly demonstrates the burdensome nature of audits, in terms of volumes, overturn rates, and company resources required to respond to them, which is critically needed to make our case for meaningful audit reform. Please support this effort by participating in and completing the HME Audit Key survey. In addition to providing critical data for the campaign for audit reform, your company can directly benefit from participating in the Audit Key. Individual suppliers will have access to their own quarterly survey numbers, as well as aggregate survey results and key findings. Suppliers can use this information to see how they compare to other suppliers in terms of audit volumes and appeal overturn rates. Your company’s individual experiences will never be shared, but will be included in the aggregate data. AAHomecare will offer a free webinar on May 11, at 2:00 p.m. to provide a step-by-step guide for registering and completing the HME Audit Key survey. This webinar, presented by Kim Brummett of AAHomecare and Randi Dessingue of PCS, will simplify the process of completing the survey and offer insight into the use of the survey data. The webinar will also provide a review of the information required to fill out the survey, along with tips for completing it. Register today for the free webinar on May 11!